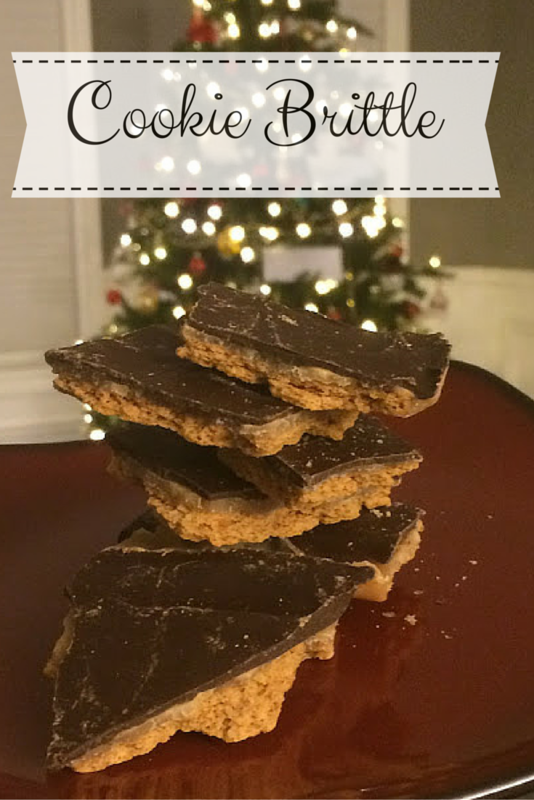 Have you ever tried cookie brittle??? Prepare to love me. No seriously, the recipe I'm about to share with you is not only ridiculously quick and easy it's also freaking DELICIOUS! For real, people request me to make this on the regular. I just had to make a few batches for a cookie exchange and Mr. B requested a few extra just for us him. melt butter in pan on high heat. Once melted add brown sugar and stir constantly. when brown sugar/butter mixture turns to a light brown color, remove from heat and pour over graham crackers. melt one bag of chocolate chips (approximately 2 cups) using a double-boiler or over low-heat. pour melted chocolate over baking sheet. What baking is complete without a glass of red? This is the light brown color you're waiting for. Be careful, this butter/brown sugar mixture is bubbly and HOT!! Why do we love these so much? Well Mr. B calls them "skor cookies" because that's what they kinda taste like. Soooooo good! My advice: if you're going to try this recipe, just go ahead and make two batches, you'll be glad you did!